Mish's Global Economic Trend Analysis: PEW Study Shows Trillion Dollar State Pension Gap; Can Anything Be Done? 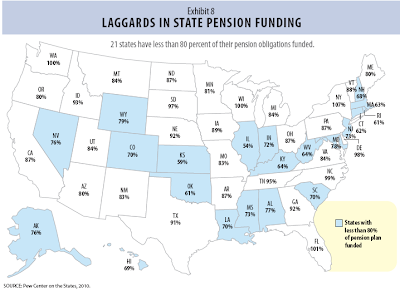 PEW Study Shows Trillion Dollar State Pension Gap; Can Anything Be Done? Inquiring minds are reading a 66 page Pew Center study on the Trillion Dollar State Pension Gap. A $1 trillion gap. That is what exists between the $3.35 trillion in pension, health care and other retirement benefits states have promised their current and retired workers as of fiscal year 2008 and the $2.35 trillion they have on hand to pay for them, according to a new report by the Pew Center on the States. Pew’s figure actually is conservative, for two reasons. 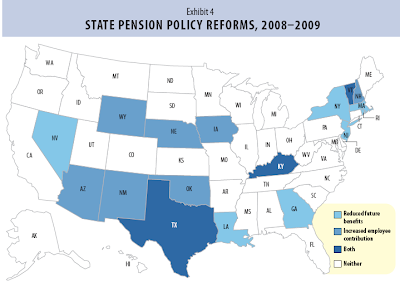 First, it counts total assets in state-run public sector retirement benefit systems as of the end of fiscal year 2008, which for most states ended on June 30, 2008—so the total does not represent the second half of that year, when states’ pension fund investments were devastated by the market downturn before recovering some ground in calendar year 2009. Second, most states’ retirement systems allow for the “smoothing” of gains and losses over time, meaning that the pain of investment declines is felt over the course of several years. The funding gap will likely increase when the more than 25 percent loss states took in calendar year 2008 is factored in. In eight states—Connecticut, Illinois, Kansas, Kentucky, Massachusetts, Oklahoma, Rhode Island and West Virginia—more than one-third of the total liability was unfunded. Two states had less than 60 percent of the necessary assets on hand to meet their long-term pension obligations: Illinois and Kansas. Illinois was in the worst shape of any state, with a funding level of 54 percent and an unfunded liability of more than $54 billion. Retiree health care and other non-pension benefits create another huge bill coming due: a $587 billion total liability to pay for current and future benefits, with only $32 billion—or just over 5 percent of the total cost—funded as of fiscal year 2008. Half of the states account for 95 percent of the liabilities. All but three states—Idaho, Oregon and West Virginia—use a smoothing process in which investment gains and losses are recognized over a number of years.10 Smoothing is a way of managing state expenditures by preventing contribution rates from suddenly jumping or dropping. The number of smoothing years varies, with five years being the most common. Because only a portion of the 2008 losses will be recognized each year, there is a great likelihood that pension funding levels will be dropping for the next four to five years. No states moved completely away from defined benefit plans in the past two years. The last two that took any steps in this direction were Alaska, which moved new employees to a defined contribution plan in 2005, and Michigan, which moved new state employees to a defined contribution approach in 1997. In light of severe investment losses in 2008 and 2009 that resulted in decreased pension funding levels, policy makers are once again openly discussing defined contribution plans. Louisiana lawmakers, for instance, are looking at the recommendations of a pension panel that studied making this switch. Other states where this has been mentioned by policy makers include Florida, Kansas and Utah. Because unions and other employee representatives often have vigorously opposed defined contribution plans, it is unclear whether any state will find such a switch viable, or if such plans are primarily being proposed as a starting point for hybrid plans or other compromises. In eight states—Connecticut, Illinois, Kansas, Kentucky, Massachusetts, Oklahoma, Rhode Island and West Virginia—more than one-third of the total liability was unfunded. Two states—Kansas and Illinois—had less than 60 percent of the necessary assets on hand to meet long-term pension obligations at the end of 2008. Illinois. The state in the worst shape in fiscal year 2008 was Illinois. With a combined funding level of 54 percent, the five pension systems of Illinois had accumulated a total liability of $119 billion, $54 billion of which was unfunded. To start closing that gap and covering future expenses, the state should have made an actuarially required payment of $3.7 billion in 2008. Instead, it contributed a little less than $2.2 billion, meaning that the state will face a bigger gap in 2009 even apart from investment losses. For Illinois, the unfunded liability is more than three times annual payroll costs. Oklahoma. The seven state-administered pension systems had a combined funding level of 60.7 percent in fiscal year 2008, a total liability of $33.5 billion and an unfunded liability that was 219 percent of total payroll. During the 1980s and 1990s Oklahoma increased benefits, but did not boost contributions enough to offset those increased liabilities. By pushing the costs into the future, the state’s actuarially required contribution has risen to almost 21 percent of payroll, annually. Rhode Island. The four pension systems administered by Rhode Island had a combined funding level of 61.1 percent in fiscal year 2008, with a total liability of $11.2 billion and an unfunded liability that is close to three times payroll. Connecticut. With a combined funding level of 61.6 percent, Connecticut’s three pension systems had a total liability of $41.3 billion in fiscal year 2008 and an unfunded liability that is nearly four and a half times its annual payroll cost. The state’s current collective bargaining agreement lasts until 2017, which limits reform options. Kentucky. Kentucky’s six pension systems had a combined funding level of 63.8 percent, and a total liability of $34 billion in fiscal year 2008. The Bluegrass State had an unfunded liability that was 234 percent of payroll. 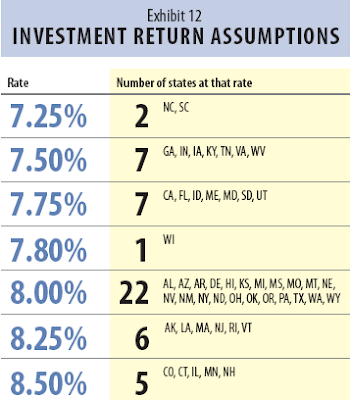 In the vast majority of states, the effect of significant investment losses from 2008 and early 2009 have not yet been fully factored into contribution rates. 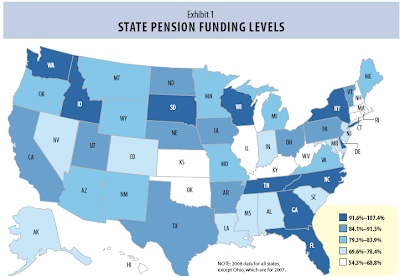 But given the extent of the losses, it is likely that even states that have funded their pension plans well in the past will face large increases in annual payments. Paul Cleary, executive director of the Oregon Employees’ Retirement System, expects that because of investment losses, its employer contributions will rise from 12 percent of payroll paid in the state’s current biennium to 18 percent56 of payroll in the 2011–2013 biennium, about a $750 million increase. “When we look at cumulative investment returns over the last 10-year period, it was worse than the decade that included the Great Depression,” said Cleary. In New Jersey, with a pension system that was about 106 percent funded in 1998, the state legislature began to dramatically underfund its annual contributions. Between 2000 and 2006, the state never exceeded 30 percent of the required contribution. By 2008, the total funding level had fallen below 73 percent. Recently defeated Governor Jon Corzine (D) emphasized the need to improve the state’s pension situation and increased funding in 2007 and 2008, but during the financial crisis, the resolve to do a better job of supporting the pension system all but vanished. According to Frederick Beaver, director of the New Jersey Division of Pensions and Benefits, New Jersey was supposed to pay about $2.3 billion in 2009 but contributed just $105 million. For 2010, the amount required was about $2.5 billion, but just $150 million was budgeted. “There was just not money to go around for everything,” said Beaver. Once a state promises a retirement benefit, it is extremely difficult to take it away. This is true in every state in the country, albeit to varying degrees. In general, pension benefits that already have been earned have strict constitutional or contractual protections, although the right to continue to accrue benefits going forward is slightly less certain, according to Keith Brainard, research director for the National Association of State Retirement Administrators. 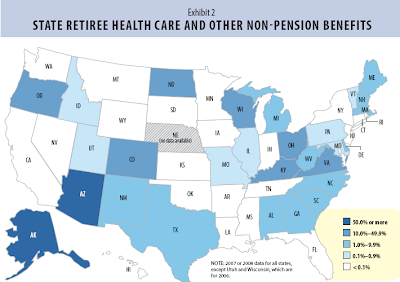 In some states, retiree health benefits also are protected.85 Even in states that have more flexibility to change benefits for current employees, the political difficulties are formidable. No legislature wants to antagonize government employees who, at the least, vote in elections and, at worst, can turn into powerful political foes. There also is a question of fairness. Should employees who have been counting on retirement benefits and who have considered them to be part of ongoing compensation suddenly discover that those benefits have disappeared? The question of fairness runs both ways. Is it fair for public servants to make slaves out of everyone else so they get benefits the private sector doesn't? Moreover, corrupt politician unfairly bought votes at taxpayer expense for ill-gotten gains of themselves and the unions. In other words, there was no fair bargaining process in the first place. The entire system was and still is corrupt. The most unfair thing would be to allow those gains to stand, not to take them away. The courts might not allow what is fair (outside of bankruptcy or default and that may be where we are headed given the blatant arrogance and greed of unions). However, there are quite reasonable courses of action going ahead. The table of expected returns above is part of the problem. It is ludicrous to believe that 8.5% returns or even 7% returns can be had when short-term treasury yields are 0% and 10-year treasuries are yielding under 4%. Moreover, we are on the heels of a 70% stock market rally, stocks are more than priced for perfection, and corporate bonds spreads to treasuries are extremely tight. Yet pension funds are planning on leveraging up now. I described the folly of such actions in Wisconsin's Pension Strategy Update: Disaster Looms Over "Free Lunch" Proposal. Inquiring minds are digging deeper into the State of Wisconsin Investment Board (SWIB) ideas to rescue Wisconsin's deeply underwater pension plans. The plan is get the investments back on track using leverage starting out at 104% escalating up to 120%. The board even considered 200% leverage at one point. There is simply no beating around the bush with this. Anyone who believes in "free lunches" is a fool. So is anyone who thinks leverage reduces risk. Here is a simple rule to live by: If anyone, anywhere, ever promotes "free lunches", and you believe it, you are as big a fool as he is. The problem with pension plans in general is that rate of return assumptions are too high. Anything that one does to stretch for those returns increases risk. That is a simple statement of fact. Here's the deal. US equities are up 63% from the lows. Foreign equities are up as much as 100% or more. The odds of a huge correction is enormous. It makes absolutely no sense to be in equities at all, unless one is heavily hedged. It makes no sense to be in junk bonds either. Although high quality corporates are likely to be OK, this is not a particularly good time to be in those either, especially if one is hoping for capital gains. Instead of using leverage, I propose the state of Wisconsin go to 60% cash and wait for better opportunities. Alternatively, if the SWIB wants some risk, they should take a crack at shorting the market here. But that is not the way that these guys think. They cannot stand cash. And they do not like treasuries. So when the S&P plunged to 666, they rode it down all the way. At the bottom, they had no cash to deploy. That is the foolishness of all in all the time. Moreover, use of leverage means one is more than all in all the time. Somehow that is supposed to be a free lunch that reduces risk?! After a 63% rally off the lows? 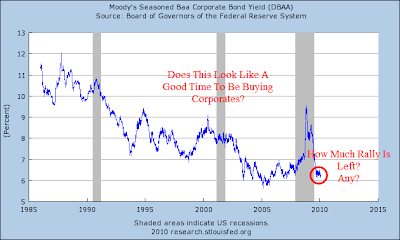 With Baa corporate bond yields looking like this? Unlike Hussman, I have not done any statistical analysis of my estimates. Certainly his "estimate a probability of about 80% of fresh credit difficulties accompanied by a market plunge over the coming year" is reasonable enough. Note: those probabilities were written in December. The odds of a strong rally now, are less likely, perhaps 10-15% at best. Note that Hussman's 80% probability of a plunge encompasses a plunge where the bottom holds and also where it doesn't. One of the problems pension plans faced was the stock market decline between 2000-2003. The same problem is about to hit again. Illinois, as well as every other state likely has pension returns and revenue growth assumptions that are way too high headed into a recession. The likelihood of negative returns and falling revenues simply is not being planned for by any one at any level. I am willing to repeat the exact same warning. The odds of another huge stock market dip in 2010 or 2011 are huge. The odds of another recession in the next 10 years are also huge. Heck, the odds of double-dip recession in 2010 or 2011 are very substantial. Fundamentally, a huge wave of boomer retirement is coming up, and those retirees will be drawing down funds and lowering lifestyles, not contributing and consuming more. Moreover, global wage arbitrage still has not played out and there is huge downward pressure on wages and jobs. Credit card defaults are still soaring, and banks are still sitting in hundreds of billions of dollars worth of assets held off the balance sheet. The S&P PE is over 20, a number associated with market tops, not bottoms. Structurally, unemployment will remain high for a decade. And finally, consumer attitudes towards debt and risk have reached a secular peak and have turned. That is not a backdrop for a huge bull market in equities or a massive bet on inflation either. Pension plans better figure this out and act accordingly or they are going to dig themselves an even deeper hole. States better wise up and kill defined benefit plans before they go bankrupt and/or start a massive taxpayer revolt. There is no other way out.